Why you should use our service over Death by captcha ? We have the fastest solution in recaptcha v2 solving than deathbycaptcha.Also our service is extremely cheaper than them. By using our service you are getting lots of money saved every month. DBC normal captcha price - 1.39$ plus night time price. Our price is just 1$ per 1k for all hours. Recaptcha v2 DBC price is 2.85$ per 1k. Our price is just 2.5$ per 1k plus bulk volume discounts above 50k. History of all captchas uploaded datewise and captchatype wise with money taken. No claim for bad captchas. We solve recaptchas much faster and we have the best solution for recaptchas in the market. Supports bypassing normal captchas,recaptcha v2 and invisible recaptcha. 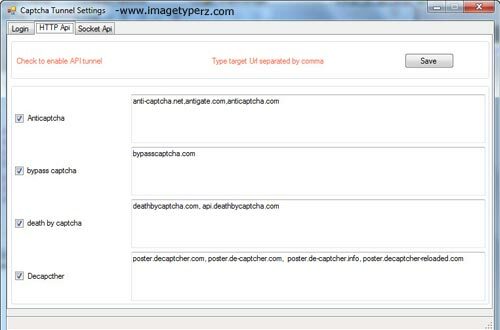 Do you want to use imagetyperz and your software is not integrated with our service and works only with death by captcha. The last step, is to use replace access token OR username & password with credentials from magetyperz. In this way, the programs will run even though they were built for one of the services above, but in reality our service will be used for completion. In case your software is not integrated to our services then you will need Captchatunneling. Nevertheless if you have your own software then merely run through our API section. Our captcha APIs like bypass captcha solver, death by captcha API, and decaptcher will help you to integrate your software in a very simple way. We are at your services 24/7/365. We charge only minimum rates and cheapest in the market and all services are solved only with human decoders and no machine supported OCRs to maintain accuracy and speed. You need to follow some easy registration formalities and some easier downloads to get started. You will be able to get solutions to all your queries with regard to using bypass captcha, death by captcha software and decaptcha services. With the simplest integrations through captcha tunneling you will be able to get all these outstanding captcha breaker and captcha solving services from deathbycaptcha activated. In case your software is not integrated to our services then you will need Captchatunneling. Nevertheless if you have your own software then merely run through our API section or if our service is already integrated with your software just enter your username and password and you are ready to kill captchas. Different Application Programming Interfaces like decaptcher, Captchabot API protocols, bypasscaptcha, deathbycaptcha, and antigate are supported by our services. In case you have other APIs or software then you will not be allowed to bypass captcha. However if you possess the rights of an admin to run captcha tunneling or .netframework 2 or .netframework 3.5 then you will not be debarred. Only if you integrate your API then excavating right captcha decode in the future will be possible. 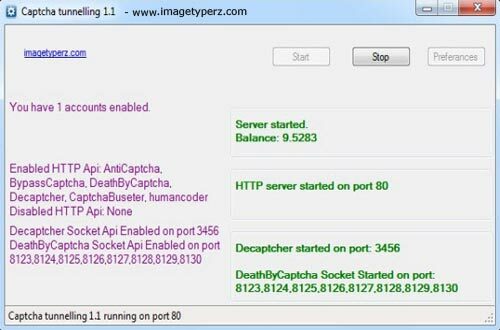 Our services of deathbycaptcha support bypasscaptcha API, decaptcher API, Antigate, and deathbycaptcha API. What you need is .netframework 2, rights of an admin to run captcha tunneling, and .netframework 3.5. Run our captcha tunneling prior to starting your software. Register and create an account on www.imagetyperz.com and then credit it. Upload captcha tunneling from http://www.imagetyperz.com/api/new/imagetyperz.zip and then install it. Enter your username as well as password here and save it. 3) In HTTP API you will find a list of decaptcher services. You need to allow any accessible one in your software. For example if death by captcha service is included in your software then you can enable the box and save it. 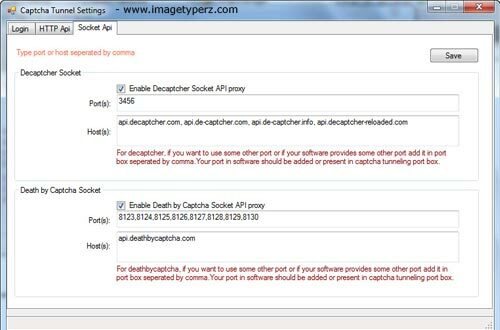 4) Both socket API in addition to http API are offered by Decaptcher and Deathbycaptcha. If your software utilizes HTTP API then you can enable any one of that. At times you will be asked for your socket number then you need to feed the info by clicking socket API and enabling the service and saving it. 5) Some new ports have been listed for decaptcha and deathbycaptcha. In case you wish to use other ports, then insert them in the port box by separating them with commas. This way you will be able to use any single host from the pack of hosts. HTTP server started on port 80 and For socket API enabled or not enabled message as per your choice. NOTE : You have to enable just one linked service and not all available services. Select the number of threads that you will use for your socket API from the drop down box. You can set up any software to use our services. Below is an example using sick submitter. You can set any software to use our service. Here we show example of death by captcha with sick submitter. Choose the deathbycaptcha service you have enabled with captcha tunneling. Give some random username and password. Click save. If you can check balance test it. It will show result as success and some random balance. Just save your settings. Our test is successful and it shows some random balance. Now the software is ready to use our service. Start your software and get your captchas solved in seconds by our service. For your information, these API's integration into software is absolutely free. Remember. Free also doesn't mean any hidden charges. Remember: you don’t need account with credits in death by captcha to use tunnel. You can use any death by captcha free account or deathbycaptcha random username and password. You need credits only with our Imagetyperz service as all captchas will be redirected to our decaptcher service.